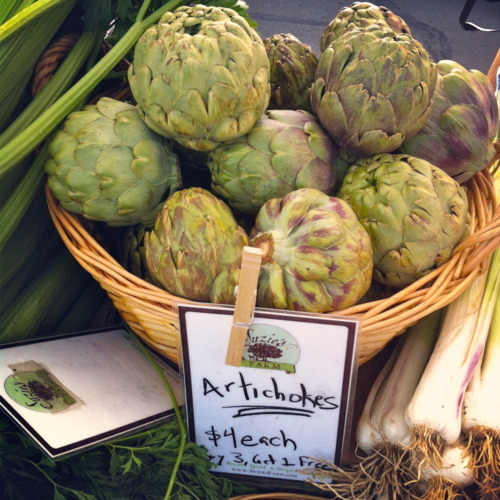 It’s artichoke season! Hooray. 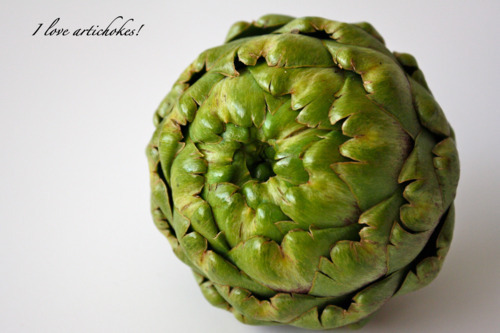 Like asparagus, peas, & other bright green spring veggies, I absolutely adore artichokes. In fact, they are my all time favorite. So, imagine my excitement when I received the great news from my CSA’s newsletter that I’d be receiving them in my share! Especially when they are selling them at the market for $4 bucks a pop. I received two in my last share, & as much as I’ve wanted to covet them, they obviously need to be enjoyed! I savored one a few nights ago, & decided tonight I’d say a bittersweet goodbye to the other one. Fingers crossed there will be a few more in this week’s share! With kitchen shears, trim the thorny tips from the outer leaves. In a large pot, add a few inches of water, & to flavor the artichoke add a clove of garlic, a slice of lemon, & a bay leaf. Insert a steaming basket, add the artichoke, & cover. Bring to a boil & reduce heat to simmer. Cook for 25-45 minutes, until the leaves are just tender. There are many ways you can enjoy your artichoke once it’s been prepped & steamed. Some people prefer to dip it in melted butter (or Earthy B if vegan), but my favorite way is dipped into a vegan “aioli” composed of vegenaise, lemon juice & zest, & lemon pepper.” It’s the best! Well, it’s back to full time work for me tomorrow, folks. I’ve truly enjoyed having more time to dedicate to Vegenista over the past 2 weeks of spring break. Only 9 more weeks until summer!